A landscape has two basic elements: the hardscape and the softscape. Adding free-range chickens to this equation is easy. Hardscape describes all the non-living or man-made materials in a landscape, such as concrete, stone, and gravel. Softscape describes all the living materials in a landscape, such as plant materials, flowerbeds, mulch, and soil amendments. Soil amendments are materials or products added to a soil to improve its condition and quality, particularly for its ability to provide nutrients for plants to grow and thrive. Whether you have an existing garden, or you’re starting with a clean slate to create a new garden or an outdoor area, you need to consider both of these landscape elements carefully. Before adding chickens to an existing landscape, take the time to look for any existing potential hazards and remove them. Potential hazards include anything like open pits, leaky irrigation, cluttered junk, abandoned buildings, sharp objects, poisonous plants, and old pesticide containers. Budget: Budget is everything. It sets the parameters for your total project and helps you make decisions based on cost. Style: Style is the creative look, feel, and ambience you’re seeking. Your style guides you through your hardscape and softscape selections. Functionality: Identify the activities that give you purpose-driven reasons to be in the garden. 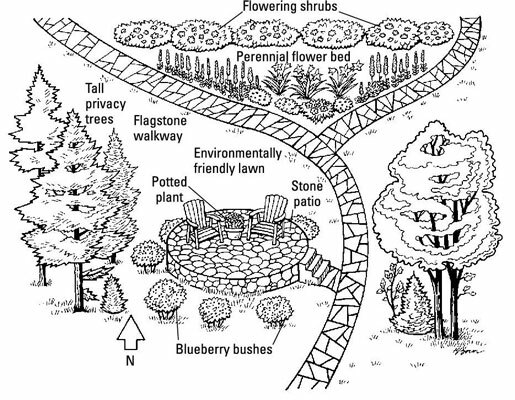 Important space allocations and specific requirements of these activities help further refine your landscape design. Living elements: Chickens and family pets are an important living element to your garden design, and you must consider their needs in your landscape design. Consider using a favorite color as an accent and a running theme throughout your garden by using hardscape and softscape elements. For instance, you can repeat an earthy sunset rust color in a curvy concrete path, a plant palette, and a garden bench.